We’re baaack! and still a bit mentally groggy from both travel and the amount of things waiting for us when we got home. Jennie did a great job while we were gone, probably better than we would have done, it’s all the emails, phone messages and such that we are digging through. We had a great time and will have a full report coming next week but wanted to get a newsletter out before market tomorrow to let you all know what was going on. First three important updates: 1. Tomorrow is the first day of the Saturday Carrboro Farmers’ Markets Winter hours, 9:00-12:00 starting with the bell (no sales allowed before 9:00). 2. All the turkeys are now reserved. 3. We will be roasting peppers tomorrow, probably for the last time for the season. When we got home we were glad to see the cover crops coming up well despite the dry conditions since we seeded them, hopefully we will get some rain today. We also knew that we had the killing freeze last Friday night (25 degrees here at the farm) and the peppers are now black and dead. We choose not to go through any kind of heroics to cover a quarter acre of plants as we think the returns are marginal this late in the year for the difficulty in involved. Jennie did strip the plants of all available fruit and we now have a cooler full that we will have available for the next few weeks. The rest of the crops look really robust but continue to slow down their growth with the shorter and cooler days. 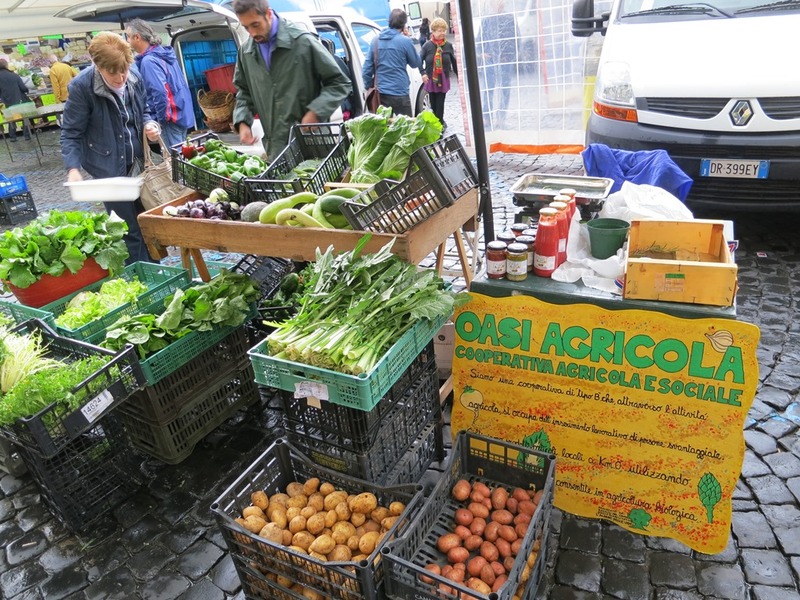 We did make it to a number of markets around Umbria and I would have to say that while we saw a few interesting items they did not look as robust as we have seen before and never as beautiful as our own amazing Carrboro Market. I am not the only one who thinks this. We have a number of customers each year who have returned from a trip to Europe and come back saying that our market is every bit as diverse and the products better looking than what they saw there. Reminds us of how fortunate we are here in central NC. I will expand on this when I get the full post done but we did see a few new crops but unfortunately missed the black celery festival but did manage to eat some. New this week- Jerusalem Artichokes, baby Swiss Chard for salads or sautéing, all three Beets- Red, Gold and the striped Chioggia. As moderate supply of all the usual suspects. Turnips and Easter Egg Radishes. More Broccoli Raab, better than any we saw in Italy. Tender Spinach and the best looking Collards in the market now even sweeter from the cold nights. Sweet and tender Little Gem lettuce, Green Boston, Red Leaf and Romaine. Nice Escarole for soups and salads. Less Lacinato Kale this week but lots of Bok Choi. In herbs we have Cilantro, Dill and Italian Parsley. Plenty of the amazing Baby Ginger root. We will be roasting peppers. Still a fair supply of sweet peppers this week with Red Bells and Red, Yellow and Orange sweet Corno di Toro’s. Rounding out the sweet peppers are Green Bells, Purple Bells and Cubanelles. In hot peppers a lot of Anaheims and Poblanos for stuffing and other uses. In the rest of the hots we have Passillas, Jalapenos, Serranos, Cayennes and some of the Picante Pimentos.